Power MP3 WMA Converter can convert audio format among mp3, wma(DRM supported), wav, ogg, ape, asf(audio part), wmv(audio part) and CD audio. By using high quality encoder and decoder, the loss of sound quality will be minimized. It is very easy to use. Power MP3 WMA Converter can convert and burn mp3, wma, wav, ogg, ape, asf(audio part), wmv(audio part) files to CD directly, it can also rip CD into one of the formats directly with CDDB information. It can edit the tag information of mp3, wma, ogg, ape files easily, It can also rename files by tag information automatically. Registered version can convert DRM protected wma music files into mp3 or other formats that can be played by your iPod or portable mp3 player. 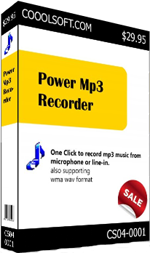 Power MP3 Recorder(MP3 Sound Recorder) can record mp3 or wav files from any sound sources of your computer, such as PC sound card, cassette tape, microphone, CD player, radio, TV, etc. The target mp3 bitrate can vary from 8kbps to 320kbps. Power MP3 Recorder(MP3 Sound Recorder) also supports queue recording, you can arrange recording at any time as you want. It can pause and resume the recording automatically by detecting sound level, so you will not hear silence while hearing the playback. By using high quality encoder, it will only produce high quality mp3 audio. It is very easy to use. Power MP3 Cutter(MP3 Sound Cutter) can cut mp3 or wav sound piece from big mp3 or wav format files directly. You can add fade-in and fade-out effect to the exported audio easily. You can also choose to cut selected audio or unselected audio. Another powerful function is that it can do batch cut job, give it a cut job list, it will do the job one by one automatically. By using high quality decoder and encoder, the sound quality loss will be minimized. AVI DVD Burner uses industry leading video audio CODEC technology to convert and burn DivX Xvid AVI movie to DVD with one click. AVI DVD Burner can maximum retain the quality of AVI movie. For the AVI which has AC3 audio track, it can give you the same audio quality as the original DVD by using direct AC3 inject technology. The subtitle of AVI movies can also be converted and burned into DVD. With AVI DVD Burner, you can experience the better feeling of watching movie on TV than on computer.